The biblical version of Jesus Christ has come under scrutiny thanks to books like the Da Vinci Code and Holy Blood Holy Grail. More recently, Shannon Dorey's research on the ancient African Dogon religion further exposes the biblical version of the saviour. According to Dorey, the Dogon religion is ancient and the original saviour, who was a hermaphroditic being, comes from a much older time than the biblical Christ. She believes that this older saviour was associated with myths involving the Merovingians. The Merovingian bloodline appeared in the Holy Blood Holy Grail and in the Da Vinci Code fiction, where the Frankish royal family was supposed to be descended from Jesus and Mary Magdalene. According to Dorey's research, the Merovingian bloodline is much older than the biblical Jesus and Mary Magdalene. It predates these biblical myths by thousands of years. 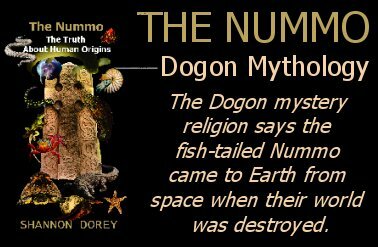 Through her research, Dorey has found links between the fish and serpent like alien Nummo talked about by the Dogon, and the Merovingians. According to legend, the Merovingians traced their ancestry back to Merovée, a semi mythical person who was born of two fathers. One was a king named Clodio and the other a sea monster that seduced his mother when she was swimming in the sea. The Merovingians were supposed to have been descended from aliens, who were the offspring of "nephilim" or fallen angels. Because of their ancestry, Merovée and his descendants were reputed to have supernatural powers and unnaturally long lives. According to the Dogon, the Nummo were aliens beings who came from the stars. They were immortal and androgynous and were primarily identified as being female. They were identified with the goddess in world mythology and were symbolized by the sun. Because they were also self fertilizing, they were identified as being virgin goddesses. Dorey shows pictures of ancient Ubaid artefacts that depict the Nummo as they were described by the Dogon elder Ogotemmêli. These statues date from 4500 BCE and were uncovered in southern Iraq from the ancient village of Ur. Some of the other human/Nummo hybrids talked about in the Dogon religion were androgynous but perceived as being primarily male. This would associate these figures with the two male fathers talked about in Merovingian myth. It was when the Nummo crossbred with the animals of Earth that these males became separated from the Nummos' immortality. They were associated with the first mortal humans. Her research reveals the Dogon religion to be the pagan mystery religion that was thought to have been lost to humanity. It was stamped out of existence in most places of the world by the Roman Catholic Church and the Inquisition. The reason this religion survived with the Dogon people is because they were isolated from the rest of the world right up until the 1930s. It was at that time that the French anthropologist Marcel Griaule began recording the Dogon religion. The Dogon people were still living in their oral culture at the time their religion was recorded making this record extremely rare from an historical perspective. Because it is a mystery religion, the meaning of the religion is hidden within the symbols. Because of the structure of the Dogon religion, Dorey believes it comes from a time when memories were much more powerful than they are today. Dorey believes the symbols represent specific information and because we aren't able to remember the meaning of the symbols from story to story, it has until now prevented the mythology from being deciphered. It is by studying the symbols in comparison to other ancient religions like Greek mythology that Dorey believes we can uncover the truth about our past. These ancient symbols are universal and appear in every ancient religion and form the basis for Christianity and Judaism. It is a complex mythology and Dorey believes it to be the oldest complete mythology in the world today.